Publisher's summary: Strange things are happening to Daire Santos. Crows mock her, glowing people stalk her, time stops without warning, and a beautiful boy with unearthly blue eyes haunts all her dreams. Fearing for her daughter’s sanity, Daire’s mother sends her to live with the grandmother she’s never met. A woman who recognizes the visions for what they truly are—the call to her destiny as a Soul Seeker—one who can navigate the worlds between the living and dead. My take: I’m struggling with my feelings about this one. 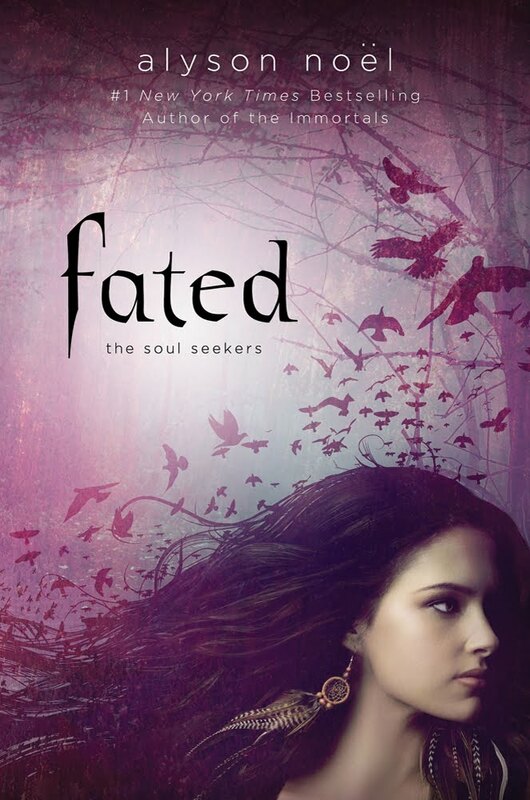 I think that I would have to say that it was just OK because, as I sit here and try to think about my thoughts while reading Fated, the things that I didn’t like or that bothered me heavily outweighed the things that I liked. Before I start to blabber about all the things that bothered me, I want to talk about the things I liked. I have to say that I actually really like Alyson Noël’s writing style; her writing is very smooth and compelling. There were also a lot of really unique and amazing scenes that painted very vivid images in my mind, and those I really liked…in particular, one scene that introduces us to the bone collector. Now on to the things I didn’t really like. While I was listening to the audio of Fated, I wondered if I wasn’t really getting into the story because of the narrator’s voice and reading style, but the more I listened, the more I realized that the story just wasn’t really intriguing me. The prologue, for one thing, is something that stands out where I thought, “What the heck was that? I didn’t know, nor did I even care to know, what the heck was trying to be said there. Then, throughout the story, I felt like I was reading (listening) to a lot of inspirational speeches. There was also way too much repetitiveness when describing the differences between the two twins, but the repetitiveness probably stood out more just because I was listening to the book instead of reading it. I don’t think that this was a horrible book, and I do believe that there are probably a lot of people who will like it. This is just not something for me. Mmm this sounds like a book I read a while ago... but with the difference that I had to literally DRAG my eyes to finish it because I was on the blog tour... I really don't even know how... with the things you listed here, you managed to finish! Do you think you'd give it another chance if you were to read an either, printed or ebook format instead of the audio? WELCOME BACK!!!!! I AM SOOOO READY TO START STALKING YOU! YET AGAIN!!!! LOL! Thanks Alba. I really don't think I'd like it better in print. I love audio books and sometimes I like the audio better than the print but when I at one point was wondering if that it was in audio was the issue...I tried to be open-minded and I really don't think that was the problem. I rarely read books more than once and if I do it's usually listening to the audio after I read an awesome book. I am so glad to finally find someone else who didn't care for this book either. I thought I was the only one! Wow, it's pretty refreshing to see a review of this book that isn't a five star review. I love Alyson Noels writing voice as well. I haven't read this one yet, but I do have it and plan on it soon.